Pest description and damage The adult juniper webworm is a copper-brown moth with white bands on the edges of the front wings. The moth is about 0.5 inch across. 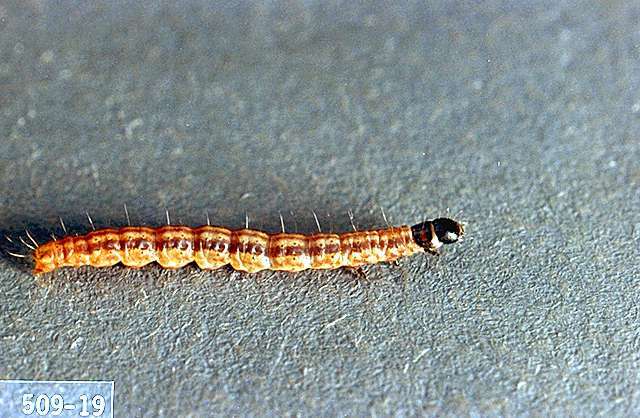 The larva is a yellowish to brownish caterpillar with dark brown lines on the back and a dark head. 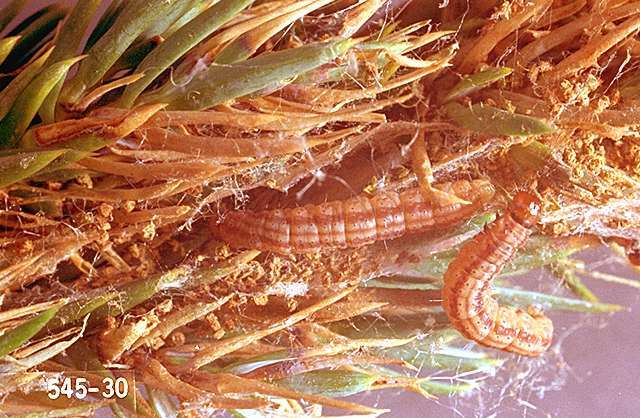 The webworm caterpillars initially feed by mining inside leaves, then they exit and gather to feed in small colonies or nests of webbed foliage as they mature. Due to their habit of feeding deep in the plant canopy, damage may be overlooked. Damaged foliage turns brown and is covered with dirty webbing. Considerable amounts of foliage may be spun together, and small trees may be completely webbed. Damage frequently is observed in early spring, March to May. This pest infests only juniper. Biology and life history The caterpillars overwinter in the nest, which consists of webbed twigs, as well as silk tubes through which the caterpillars move through the juniper foliage and webbing. These larvae resume feeding in spring then pupate. 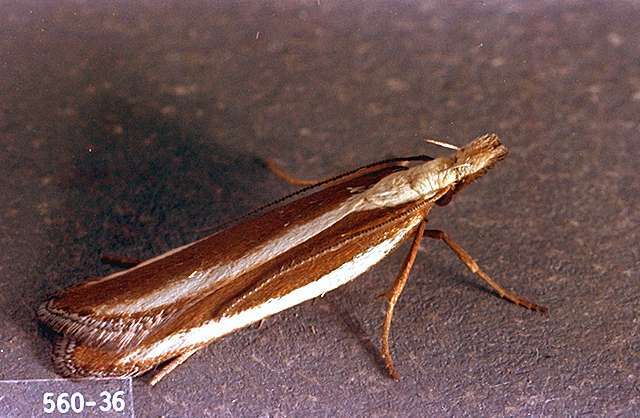 Adult moths fly in late spring. Eggs are laid on leaves of the current season's growth. Larvae feed first as leafminers, then feed on the surface of leaves, building silken tubes around the feeding site. They overwinter in small groups in these webbed sites. There is one generation per year. Pest monitoring Watch for the first signs of webbing. Hand-pick caterpillars and prune out infested growth. Irish juniper (J. chinensis 'Stricta') is the preferred host, although Chinese juniper, red cedar, and Juniperus communis varieties aurea, horizontalis, depressa, hibernica, suecia, and J. squamata 'Meyeri' also are infested. Juniperus procumbens and J. squamata are infested only occasionally.